I will not be taking requests sorry. Read the compatability section before you ask questions about that topic. I was also wondering if it was possible to just have her Blond all the time. I can do it with the source Files for her blond hair. her having with a different hair color and hair style every single time you meet is more silly than anything. 1) Miranda changing her hairstyle and hair color is not silly at all imo. 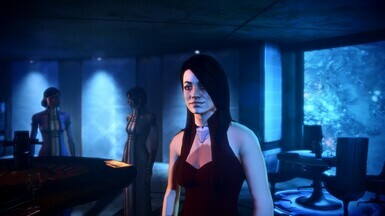 She is wanted by both Cerberus and the Alliance. Her changing her looks constantly would be a way to stay hidden. 2) A complete blonde hair version is possible. I'm just not interested in doing it at this time. 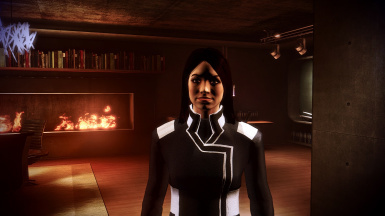 3) I don't understand what you mean by source files qaskew24, but if you mean the hair texture files, then you are mistaken on how hair works in Mass Effect 3. While there is a hair file, the color is not determiend by it. Instead, you have to open the PCC with package editor and edit values with the interpreter. Why not? 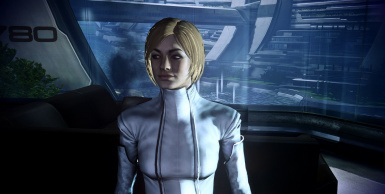 come on man years waiting for that miranda blond hair mod to come out. 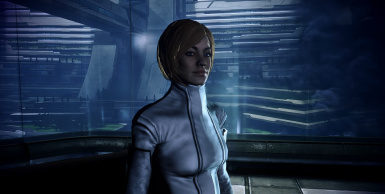 Well i hope one day you can maybe make a hair mod for Miranda, if you feel like it :) There's a mod for ME2 which does it but not ME3 yet, it's really just so she looks more like her voice actress and face model Yvonne Strahovski. Great mod. Just wanted to ask you which outfit will Miranda wear if we have JAM installed during the memorial scene ? is it possible to have Miri have blonde hair all the time? In response to post #57666731. In response to post #57596876. I wanted to use this mod. 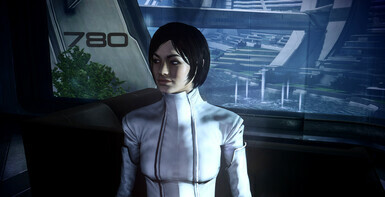 Unfortunately, during the first meeting on the Citadel, black were showing on her face and neck. Yes, I downloaded the DLC patch and did an autotoc. I just won't be using this mod then. It's unfortunate, but I'd rather have her vanilla outfit, than have mesh problems for future recordings. Did you install a lot before you installed this mod? That is why Miranda has a messed up face. You installed your mods in the wrong order. Texture mods should always be installed after DLC mods. There is nothing wrong with this mod. a lot changes settings in the gamersettings.ini that causes black textures for any mods that are installed after it. Strange. Other DLC mods are working fine, and I installed them after ALOT. 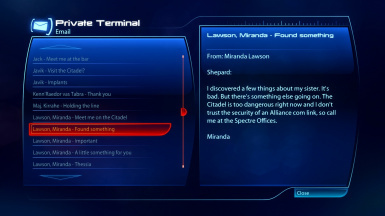 Great mod man.I would like to ask though if i use EGM's Miranda mod which allows Miranda to be a squadmate during missions which outfit or armor will she wear ? EGM Miranda mod isolates her wardrobe. 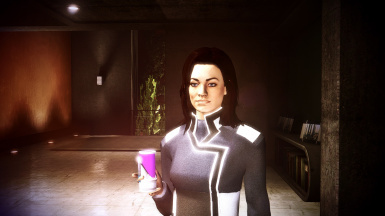 On ship she wears the default game black on white catsuit. 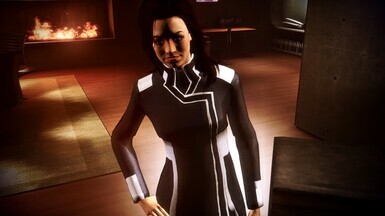 On mission she will wear the black on white catsuit or the alternate black armor. So from what I can tell there should be no impact. Good thing. It avoid casual conflicts. Just wanted to ask you did you try this with A LOT texture mod and if you did, did you install it before or after A LOT ? There is a bit of an issue. 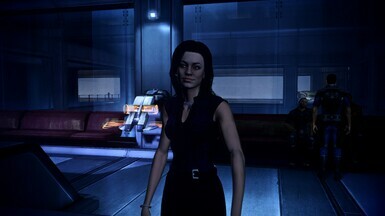 EGM's Miranda mod let you have her be in AVPen's alternate outfit on board the ship if it is installed. Now I know that mod is incompatible with this mod. Since I HATE that catsuit, is there a way to get her into something other than that on board the ship that won't conflict with this mod? 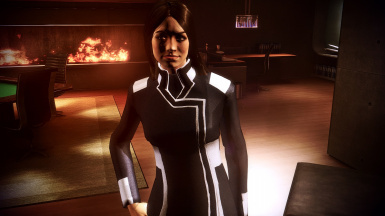 EGMS Miranda mod uses seperate files for Miranda's alternate outfit. It does not conflict with this mod. 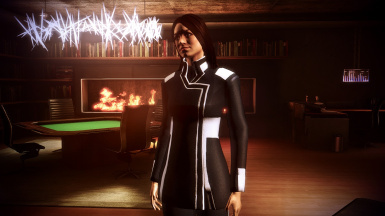 Just change it in EGM's settings to Mirandas new outfit by avpen. You do not need AVpen's mod. Very nice! Great for immersion! But I do happen to like the red casino dress. Not making a request, but just asking if it is a simple matter of deleting a file from the mod to keep it and if so which file? 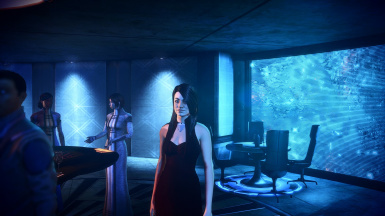 I like the long dresses and it bothers me that shep and/or company are the only ones in a short dresses. I actually have a long version of that dress for personal use. Would you want a version with that model? I would LOVE a long version of that dress!!!!! I do love the dress but just not how everyone else is in long dresses. 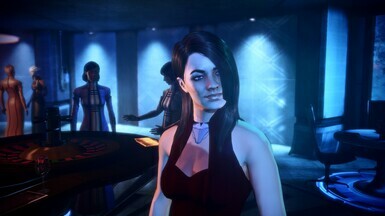 Now not to get greedy but if there was a way for my femshep to wear the long black version of that dress (I use it instead of the fugly one for the casino and other citadel 'dates') I would really be happy but will take the Miri one, absolutely! 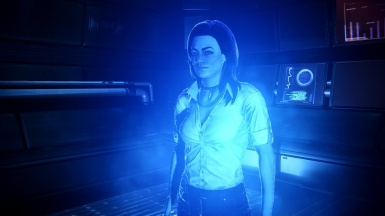 It will probably not work for femshep. The way I implemented the design only really works for NPCs. 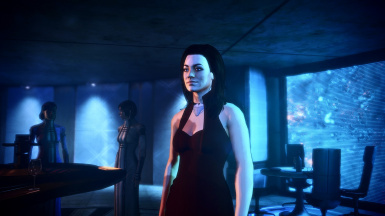 The femshep walking and running animation would be borked if I tried to use the long dress mesh with it. But would still LOVE to have it for Miri!! !